See, she's paw friendly (while holding on to the chain, really! You mean the gate stays open? Loving, playful and inviting, Maisie has made an amazing transformation into a fine companion. Given the chance, she plays with people and wants to please. Maisie is recuperating well from her rather eventful last few months. She came to me on March 15th from a backyard breeding operation. Maisie was intact and had never had any health care nor had ever been vaccinated. She had recently had a litter. I have found her to be an agreeable companion although she does not like to have other dogs come to her pen because she is jealous of her food and space. I attribute this to being constantly hungry and, having been on a tie-down, and thus unable to defend her and her puppies’ space, an untenable situation for a guardian dog. She invites me to play ‘catch me if you can’ when I allow her time in the big run to stretch her legs. She plays her Pyr games of curtsy and veer off. Another game with one of the other females is to yell at each other through the fence. She gets on quite well with my male though. With cats, she seems to have proper Pyr guardian instincts so I believe she could easily co-exist with felines, especially if the feline cooperates by hissing her! That’s what mine do if she takes too long in checking them out. I would recommend that she be adopted into a home as an only dog, very definitely not with a female, spayed or otherwise! She seems to miss human company and older children would be a boon. She does need to learn to be a bit gentler but that can be trained for. 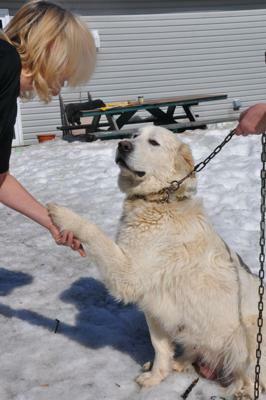 Maisie is about 2 ½ years old and was kept on a chain on a clothesline. 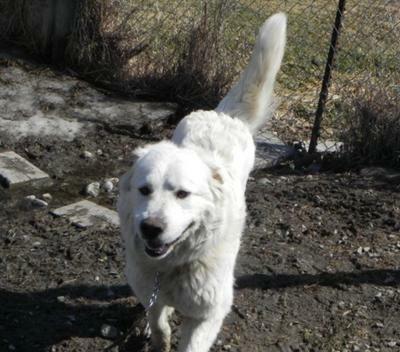 She had been bought “to keep company“ with a male Pyr cross of 18 months who had a tendency to roam; since both were intact, that strategy did not work and so, both would go exploring. The original owner, a single mother, had had her as a house dog but had sold her because of financial difficulties. 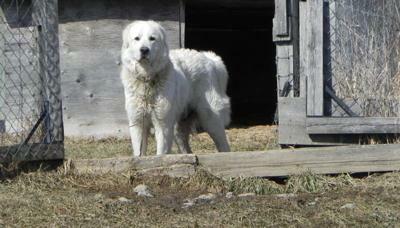 The new owners were not knowledgeable of Pyr cycles and were surprised that the two dogs bred. Because they had another pregnant female in the house and lack of a clearly defined human companion for Maisie, there was jealousy. They would not keep Maisie in the house as she was used to. Maisie had her litter outside on February 7th. 4 of the 7 puppies survived. She contacted us on March 9th to take Maisie as soon as possible because she thought Maisie was showing aggressive tendencies. She was not amenable to the other dog and her puppies when in the house. She warned off the man when he came to touch her new-born puppies and take away the dead ones. In fact, these are normal behaviours of a new Pyr mother. I assessed the situation and found Maisie to be a nice, friendly and affectionate dog who was very thin having been fed only half what a nursing mother should have and of a really substandard brand of food. Her milk was drying up and although the pups seemed fat, they lacked the energy that 4 week old pups should have. I refused to take her then unless the puppies could also come. They still needed their mum. Maisie wanted to come with me immediately. The lady categorically refused that the puppies come with the mum because she wanted to sell them, to recuperate the money she had paid for Maisie. The man threatened to give her away, immediately, as is and unspayed, to someone else. I then asked to come back a week later when the pups were better able to eat kibble moistened with milk under mum’s supervision and would be brought into the house. I took Maisie on March 15th. The lady promised to take the puppies into the house and to get a better quality kibble for them. Although still not satisfactory, at least they would be warm. In the time she has been with me, Maisie has been recuperating from the events that have affected her since she had been taken from her original home last September. She has gone from being an inside dog with children she loved, to being tied on a line outside, to having been bred and whelping in the cold, to seeing some of her pups die from lack of care, to having to leave them and being displaced again. Maisie’s milk was completely dried up. I fed her regularly and with better food. Surprise! Her mammary glands filled up with milk again! I put her on a weaning diet so she is now spayed and vaccinated. She is losing the extreme thinness of an underfed nursing mum and has a bit of flesh on her ribs. She is available for adoption but will need to review her basic commands which she knows but has not practiced for a while. She is now spayed. She will make a good companion for a family with older (10+ year-old) to hike and backpack and pull a cart with. Maisie is turning into a lovely, elegant, racy lady! I am Maisie's foster mom and we've had her for about 4 months....she is an absolutely fabulous dog and we love her! We submitted an update along with some pics for the website! Here's the link! Maisie would be a great all-round farm dog or in a place where there is room to run and stretch her legs. After the initial run, she does her rounds and if there is a human around, she will install herself to guard him or her. She would do the rounds, check the places that need to be, say hello to the animals and play with the children. She plays all by herself running and catching her chewed up toys! She loves to do the rounds with me when I visit all the nooks and crannies. Maisie has completely recovered and is asking to go run with the other Pyrs. She wants to be a Pitous as well! What a lovely friendly, happy, sociable lady.